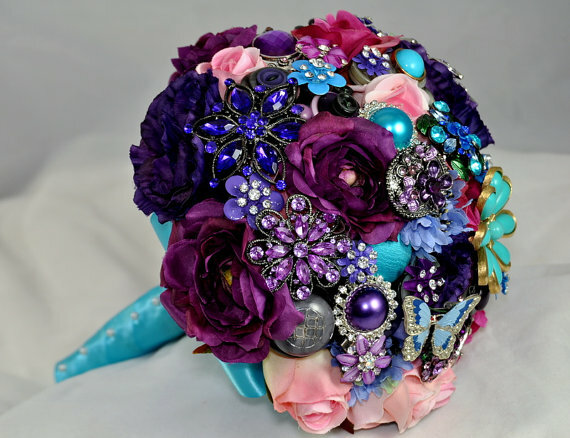 Juneberry Lane: Tutorial Tuesday: A Vintage Dream; Bouquet of Brooches . 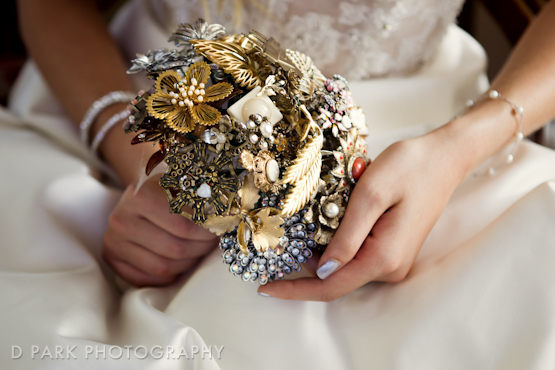 . .
Tutorial Tuesday: A Vintage Dream; Bouquet of Brooches . 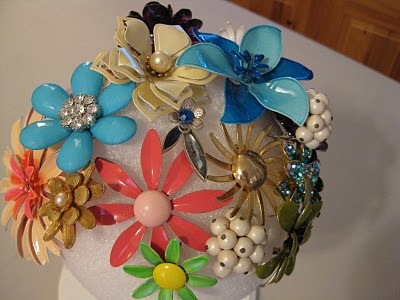 . .
One trend that is not going anywhere for the 2012 season is vintage. 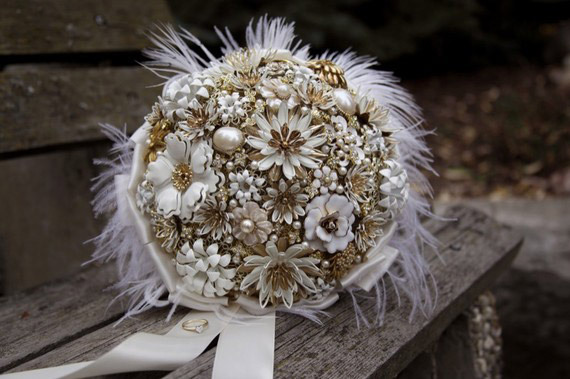 Incorporating a little old world charm is the perfect way to add glamour and elegance to your event . 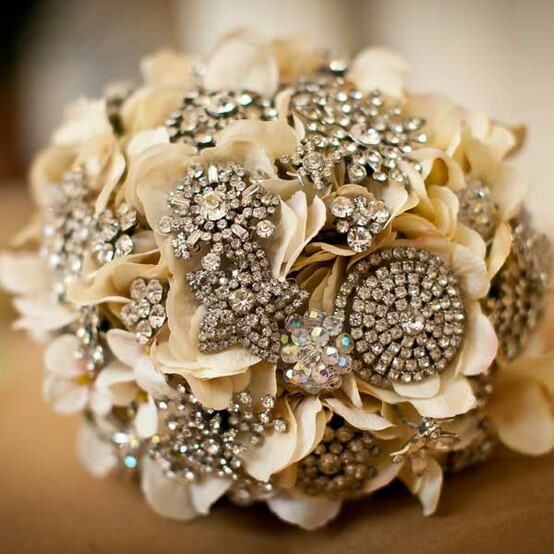 . . and even honor loved ones by making use of your family heirlooms! 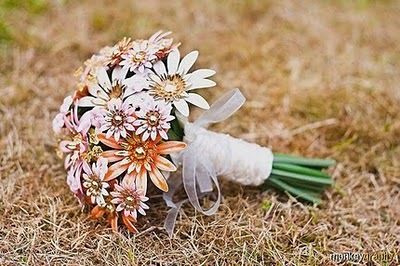 I just adore these fabulous bouquets. 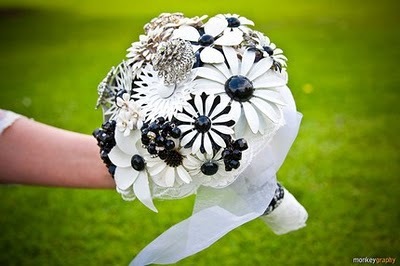 Not only do they make a major statement, but they can be made months in advance and they will last forever too . 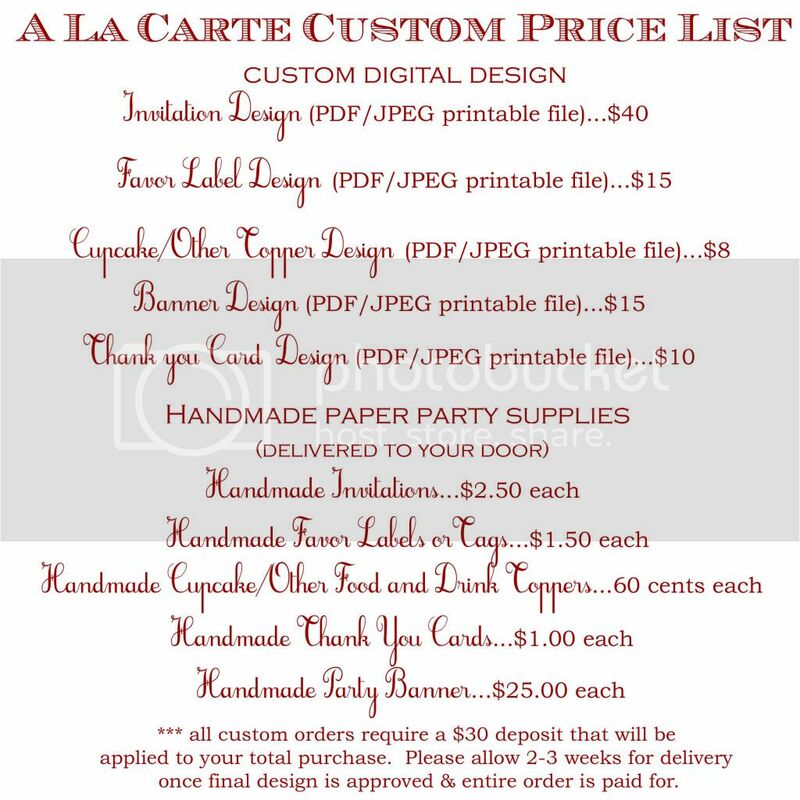 . . and think of all of the fun you can have out treasure hunting for these gorgeous goodies! 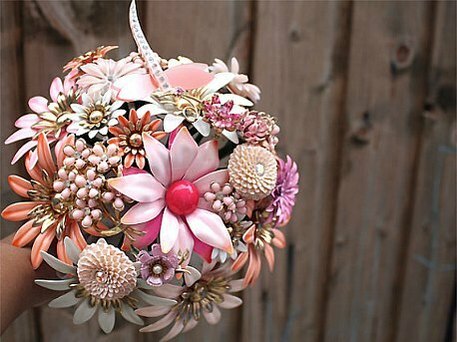 First a little inspiration, and then an amazing & easy-to-follow tutorial on how to create one of these beautiful bouquets on your very own . 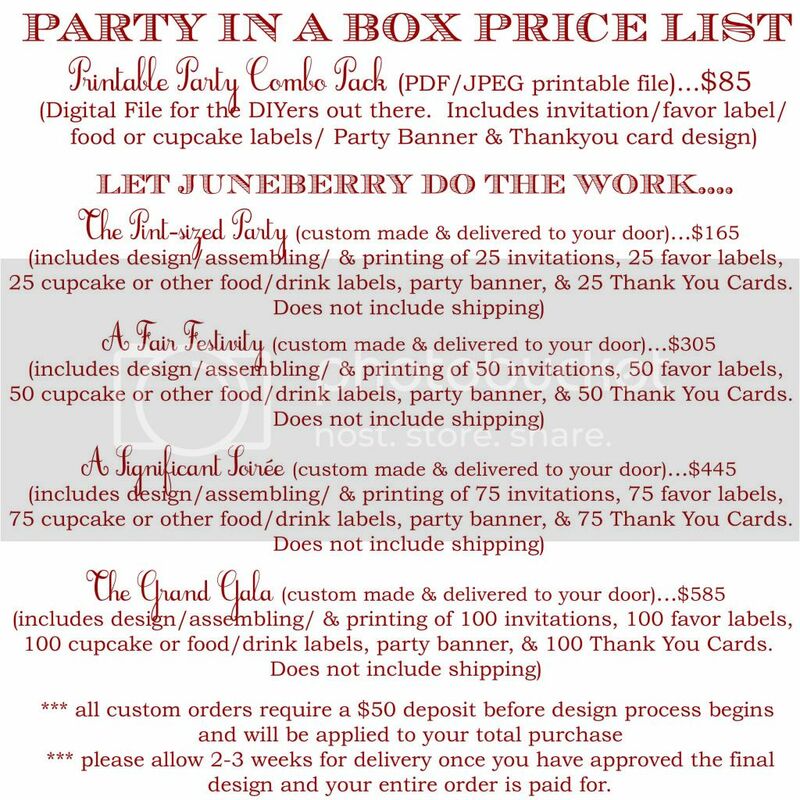 . .
And here is the amazing tutorial via House of Whimsy . . . 1.) 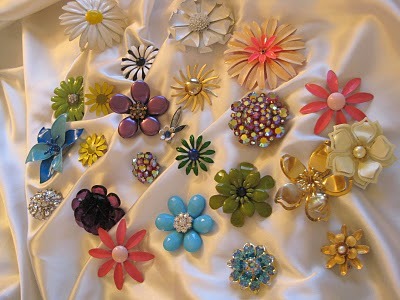 Clean the brooches! 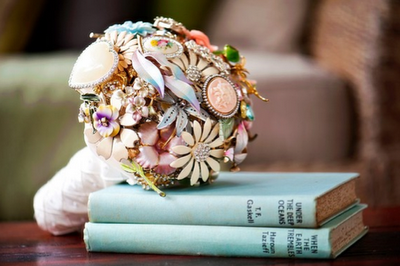 Chances are, your beautiful baubles have several years worth of dust and dirt on them. Fill a big bowl with warm soapy water, brush them with a soft bristle toothbrush, and then rinse them in a colander. 2.) 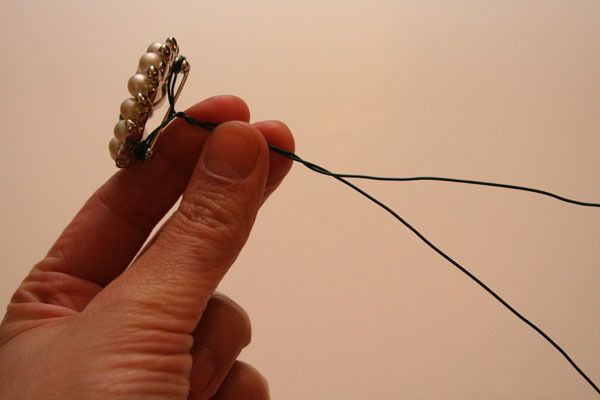 Use the pliers to wire the back of each brooch with floral wire so that it looks like a flower with a stem. 3.) Cut down the wire from each brooch to about 3”. 4.) 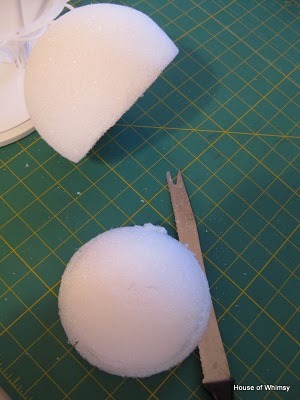 Cut two thirds off the top of the styrofoam ball and make a hole in the bottom, middle of the it, just a tiny bit smaller than the dowel ride or plastic bouquet base. Attach it to your rod/base, gluing the first inch and a half on the tip of the rod and pushing the styrofoam ball onto the end of it. 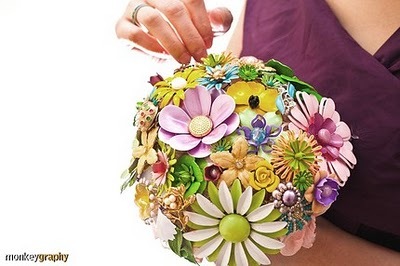 Make sure it’s good and sturdy because this bouquet weighs a ton. 5.) 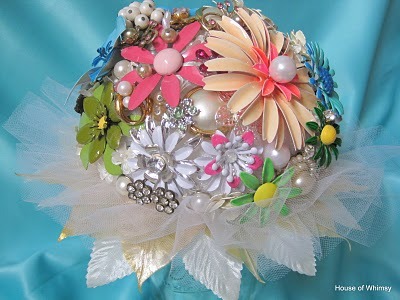 Organize your brooches into three categories: the sentimental brooches from family and friends, favorite brooches you have purchased, and your not so favorite “filler” brooches. 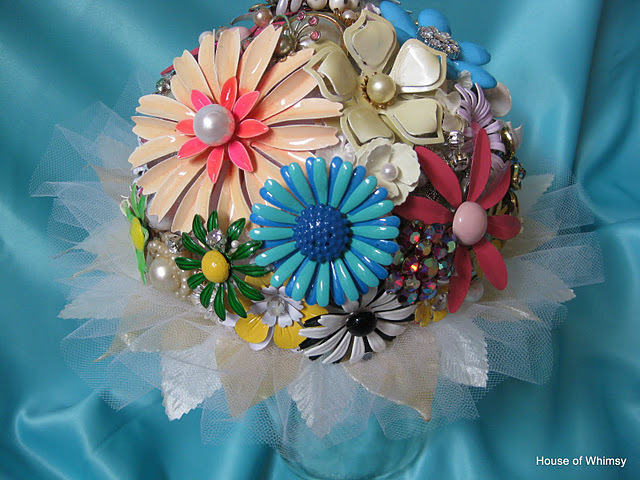 Beginning with the not so favorites, push the wires into the Styrofoam until the brooch is firmly up against it. Continue to do this and evenly spread the not-so-favorites around. These act as “filler” so that you won’t see the Styrofoam once you get all your favorites in. 6.) 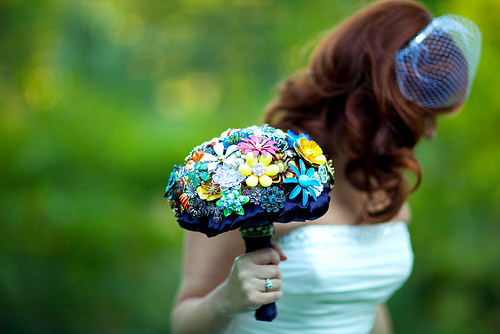 Repeat the above step until all of your favorites are in, keeping in mind the special brooches and their placement (i.e. : really special ones at the top so you can always see them and ones from family placed on the sides so they will photograph well). 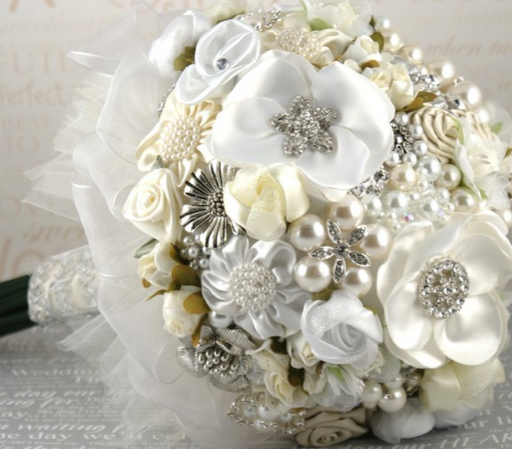 Helpful Hint: As you are placing brooches, turn the bouquet upside down and shake it gently, if any brooches come loose, grab the hot glue gun and glue the wire in. 7.) 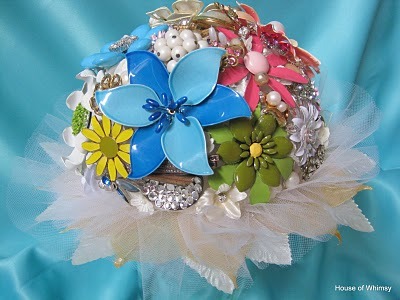 Once all the brooches are in place, grab your ribbon. 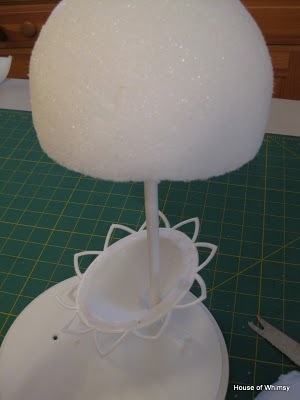 Cut it into 5” strands and begin to make loops at the base of the Styrofoam. 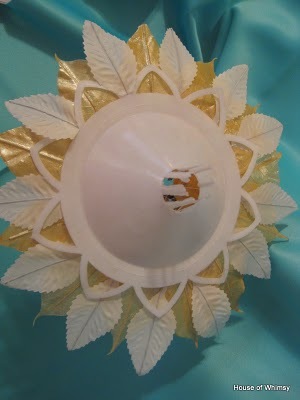 To do this, glue about ½” of ribbon to the top of the dowel where it meets the Styrofoam, then double it over and glue the other end of the ribbon at the same point—continue this all the way around the base of the Styrofoam. 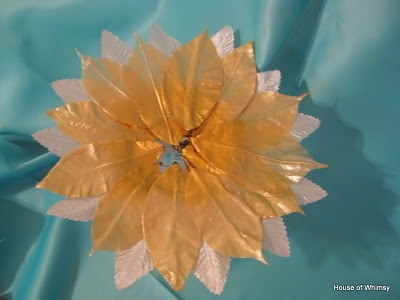 Or you can use the plastic base of a bouquet form and glue pretty leaves or material around it, as in the pictures below . . . 8.) 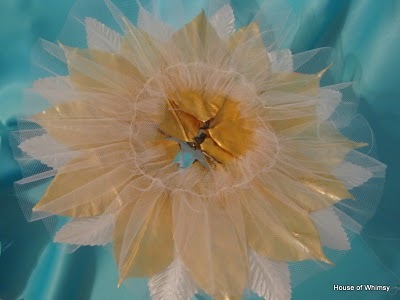 If you are using the plastic bouquet form, slide the piece with the leaves & material onto the rod and with your remaining ribbon, again glue ½” of ribbon to the dowel or plastic rod, this time starting at the bottom, and begin to spirally wrap the ribbon up the dowel, sporadically placing drops of glue on the dowel to hold the ribbon in place. Wrap the ribbon a few extra times at the top of the dowel or rod to insure the ribbon loops are fully covered. 9.) 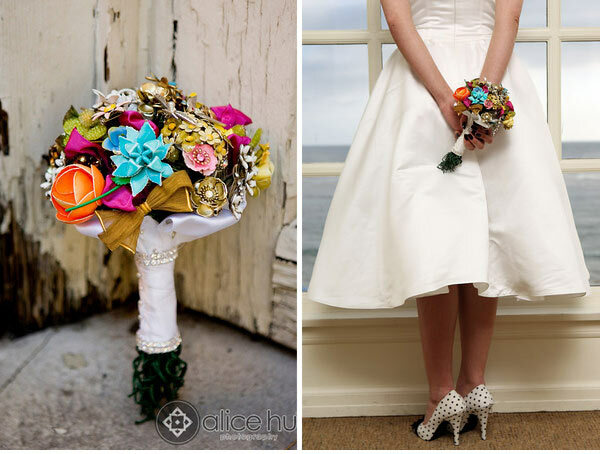 Find a vase tall enough to set you shiny bouquet in, step back and admire it. Then go do some push-ups because it probably weighs a ton! Aren't they lovely? 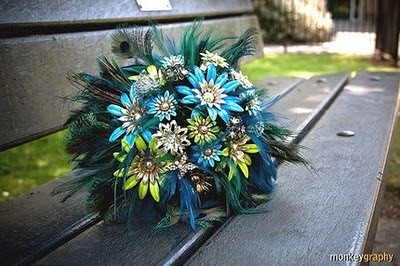 These would make stunning fireplace mantel decorations for spring too . 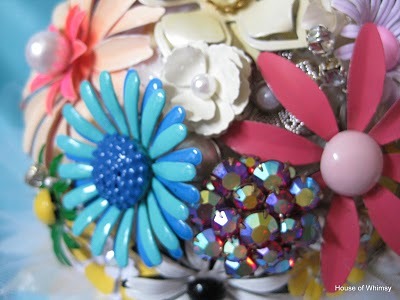 . . and collecting all of the fun & colorful jewelry is the best part! !